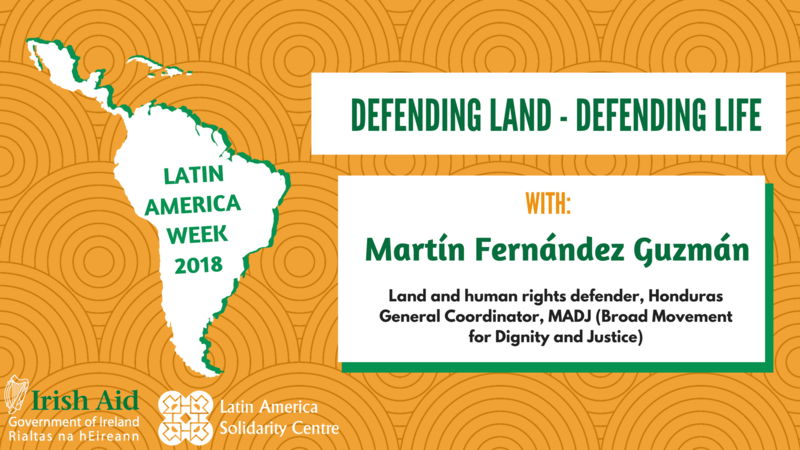 Join us in NUIG, where Martín Fernández will be walking us through land issues in Honduras. This is a free and unique opportunity to meet an activist coming directly from Latin America and gain first-hand insight of the land struggles in the region. The Movimiento Amplio por la Dignidad y la Justicia, MADJ (Wide Movement for Dignity and Justice) focuses on indigenous and environmental rights. In the midst of the current political situation following the questionable re-election of Hernandez, violence has spiked in Honduras. Like many other activists and citizens, Martín has publicly opposed the current government. As a result, he has been targeted for a campaign of de-legitimisation and intimidation by state forces, which has included death threats and violent actions, requiring 24-hour human rights accompaniment.